Dental implants represent on of the most attractive things in today's modern dentistry. They consist of strong titanium screws which effectively compensate for the root of the tooth, to which superstructures in the form of finely polished dental stumps are built, cementing the definitive dental crown. What are the advantages of these implants and what other types of replacement for our natural teeth modern aesthetic dentistry offers, find out in our article. When are dental implants used? There are very broad indications for teeth implants which range from compensation for only one or a few teeth, to the installation of complete dentures. It is possible to make a dental bridge or a special crown in combination with a plate or acrylic dentures, which greatly affects the dental implants and give extra stability. There are certain prerequisites to perform the installation of the teeth which are completely successful. What is one of the most important priority is that the patient needs to have a completely stable health, as certain aggravating conditions can cause a number of contraindications. They include diseases of the jaw bone, such as (invasive bone infections and tumors), also a number of metabolic disorders, which are not regulated, as is the case in diabetes mellitus, poor oral hygiene, then the areas that have been irradiated, or if the patient is undergoing chemotherapy. Also, what dentists pay extra attention to is the shape of jawbone; its position, height and thickness, because it is necessary for it to have enough space where dental implants are put, whereby not to impair their cohesiveness. For additional information doctors need to establish a complete dental examination, which includes x-ray of the teeth and jaw bones, and consult with other doctors before putting dental implants. subperiosteal implants (this type is installed under a periosteal and when there is not enough space for endosseous implants. submucosal implants (implanted in our mucous membranes - the soft tissue, and are used much less often because they cause complications much more often). Also we cannot leave out mini implants which are used when there is not enough space in the jaw, when the ridges of edentulous jaw are quite thin and narrow. Then the regular classic dental implants do not apply, but are often combined with complete dentures, and their task is primarily to keep the denture firmly in place. These implants are in the form of pellets to which built into the prosthesis that connects them. In order for the denture to be stable enough for the lower jaw, at least three to four mini implants are needed and for the top one even up to six mini implants. Putting implants in the jawbone takes about twenty minutes and is carried out strictly according to predefined rules. Installation procedure is completely painless thanks to local anesthesia. After anesthetic stops its effect you may feel mild pain in the jaw, which again is successfully is eliminated with the help of analgesics and usually does not last more than a few hours. 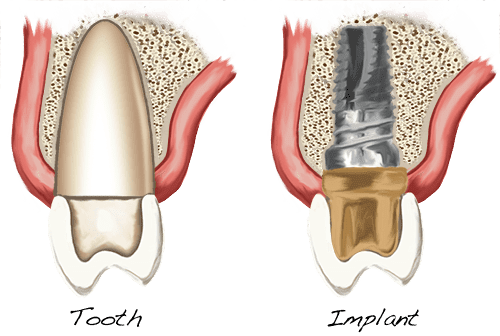 Suprastructures are much later added after four to six months, when our bone around dental implants has completely formed, that is, when it comes to so-called complete osseointegration. After incorporating coronal work it is necessary to take a dental impression and after a few days, complete the final cementing of dental crown. One of the important prerequisites when it comes to dental implants to be installed is extremely good oral hygiene, on a daily basis and detail brushing. If the advice of specialists in not followed a number of unintended consequences may occur. Due to the long-term accumulation of food around our natural teeth, there inflammation of the gums or gingivitis may occur. If this disease is not treated, the whole process becomes much more serious periodontitis which is the inflammation of periodontal tissues with resultant oscillation, the degradation of bone and tooth decay. A similar scenario real can occur with dental implants, because of chronic inflammation of gums caused by periimplantitis (inflammation of the bone around the tooth implants), which results in degradation of dental bone and eventually the implants fail. Each patient individually must be sure to successfully maintain oral hygiene, and go to essential regular check-ups at the chosen dentist to avoid the possibility of further complications. According to the latest statistics, dental implants can last up to ten years, and generally this guarantee is given by many dentists. However, in certain cases this period is much longer, even until the ending of patient’s life. Also increasingly popular is the so-called "teeth in an hour" technology of the teeth. As the title suggests it is an instant quick upgrade of teeth. Since we wait for our dental implants for an average of four to six months, which is for many people a long a period, this new technique appeared - "teeth in an hour", which requires only two visits to the dental clinic. The first time a patient needs to come for 3D imaging of the area without teeth and for a dental impression, after which the model determines the direction towards the installation of dental implants. Second visit to the dentist is for the mere installation of dental implants, abutment and cementing of temporary crowns, which lasts no less than an hour. Creation and final cementing – putting the final crown is followed only after a few months, when bone around the teeth has formed. The role of having dentures is to replace lost teeth and support dental tissues, and the compensation can be fixed (in the form of single crowns, then by a dental crowns or dental bridges, when you miss several teeth in a row). As for the dental implants and dentures there is are many types. They are made as metal-ceramic or all ceramic zirconium-compensation. Removable dentures are movable and depend on the number of our remaining teeth that can be divided into partial dentures (when we make up one or several teeth), subtotal (when we one to maximum three teeth in total remain) and total teeth prosthesis (when the patient is completely without a single tooth). Based on the material from which they are made, dentures are divided standard and skeleton acrylic dentures, which are made of metal, combined with acrylate. Today there are newer materials, which have much greater flexibility and are more comfortable for the patient, such as acetate or valplast dentures. More frequently used are combinations of these two dentures. Techniques used when making prosthetic or dental implants, imply taking precise dental impression in order to make the best quality dentures that fully complies with all the rest of the structures in the mouth. The process of making dentures depends on the type that needs to be installed. If you need a fixed dental implants, that means at least three visits to the dental in office: grinding of teeth, tryout and cementing it in place. If it comes to the mobile dentures it is necessary to do four to five visits to the dentist: in order to take the functional and anatomical (first) impression, determining the bite size and general tryout. Combined activities require more time, and each of these processes contributes to the accuracy of prosthetic work. If it is a fixed compensation, it is enough to do a regular brushing with a toothbrush and toothpaste. You can use dental floss and special interdental brushes, which successfully pass between the teeth, or a special apparatus to remove impurities with a water jet. Mobile prosthesis, in addition to regular washing can be additionally disinfected with different tablets and liquids offered by numerous manufacturers. Why some patients do not get used to dentures? The upper denture is usually much easier to get used to, but in a number of men nausea and retching appeared and they are not able to carry them, even with reduced denture plate. One solution is fixed prosthetic work, if there is enough of remaining teeth, or to incorporate dental implants. In the lower jaw there is a different problem, namely here the bone area is much smaller but the muscle area is larger, but often at the start jaw muscles move the denture by little and lift it from the reef. The solution is represented by mini dental implants, which cling to the bifurcated prosthesis reef. Experience with installation of teeth through dental implants and putting braces are numerous and it is difficult to single out a single conclusion, mainly with technological development defect. S and problems are less common. The most important thing is that the doctor presents all the possible solutions to every patient, as well as their advantages and disadvantages. The quality of the work often depends on the price, but the patient selects this on the basis of their own spending power - from the classic cheap denture to modern implants, and usually the best solution. Of course, if it is possible to carry out their installation, and if our jawbone allows it. Today, dental implants have significantly technologically improved, and their disadvantages are definitely a thing of the past. If there are no contraindications, then there is no legitimate fear of a failed installation. The materials which are used for implants are biocompatible, titanium, which means it does not have negative health effects on the body, and is well accepted and there is no immune reaction and there is no fear of rejection. Performance is guaranteed if you respect all the rules, which primarily includes insight into the health of the patient, method of installation and development of coronal work and proper oral hygiene. In the world of modern dentistry it is not possible to separate the functional and the aesthetic. The function is imperative because prosthetic work primarily takes on the role of lost teeth in order to chew, talk and support the surrounding soft tissues. The benefits of having dental implants include the preservation of the remaining teeth because you do not to grind them, there are no hooks that can loosen the tooth and the pressure when chewing is transmitted directly to the bone, thereby stimulating its preservation (which is not the case with dentures). Aesthetically it looks much better, our smile is more natural, it contributes to confidence and security, and often natural teeth do not differ from its replacement.